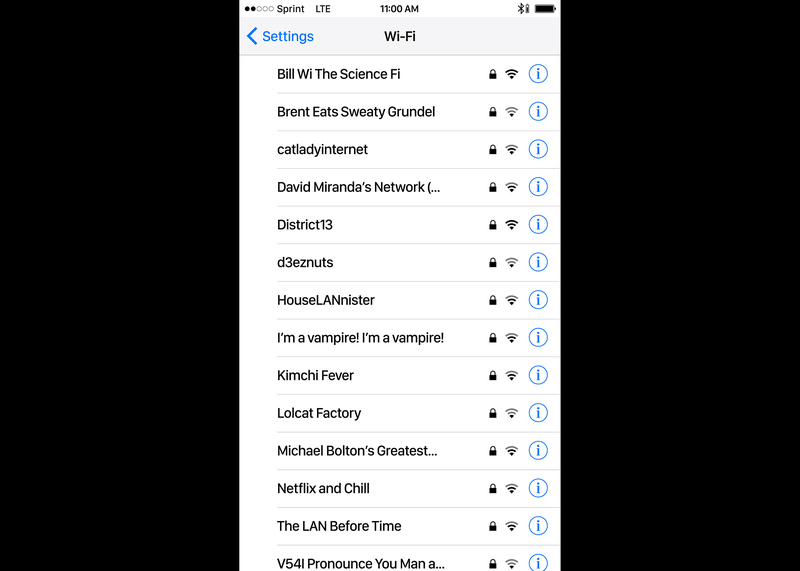 2017 Official Selection Slamdance Film Festival, Cinequest Film Festival, Calgary Underground Film Festival–Featuring the genre-busting talent of James Nasty and TT the Artist, The Real Wi-Fi Of Baltimore offers a punny and nuanced view of Baltimore neighborhoods in a short film edited from iPhone screenshots of Wi-Fi network names. 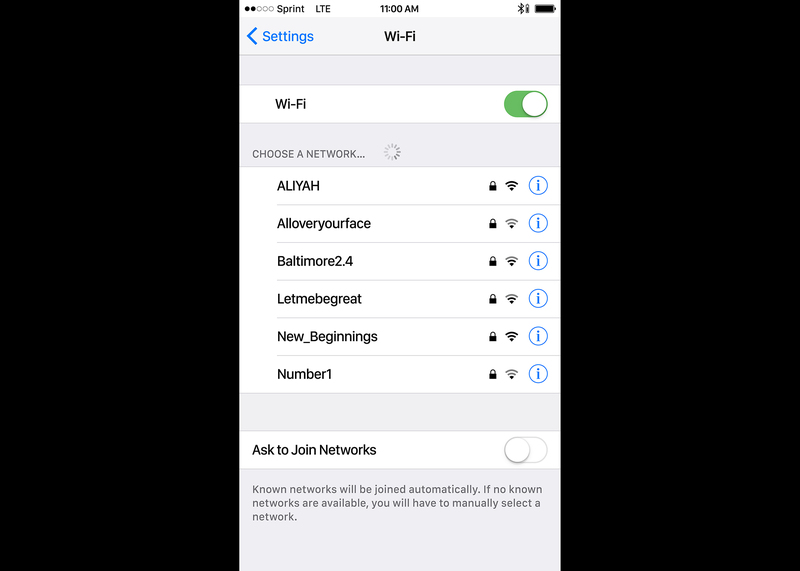 The Real Wi-Fi Of Baltimore poses this challenge: Are we connected? 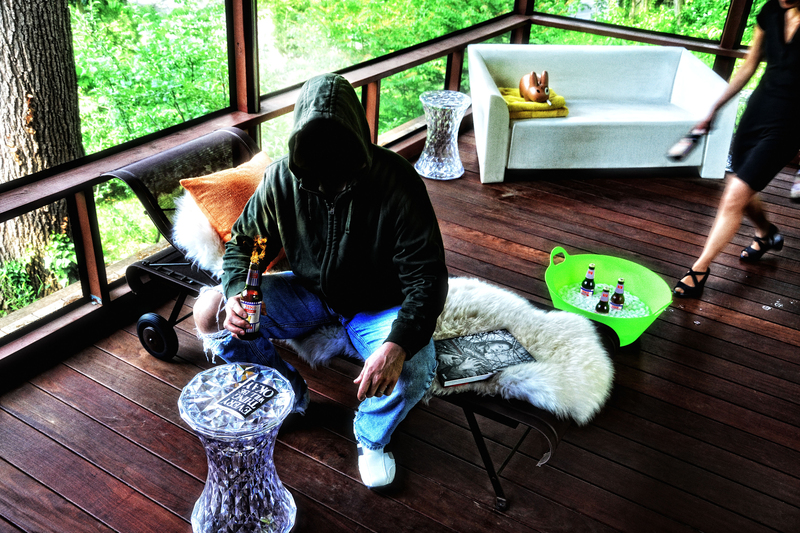 Street artist Banksy pulls off no small feat by being both the anonymous artist and the famous artist at the same time. But by being anonymous, he is like Virginia Woolf’s anonymous woman—“Anonymous was a woman.”—and anyone can appropriate his identity. 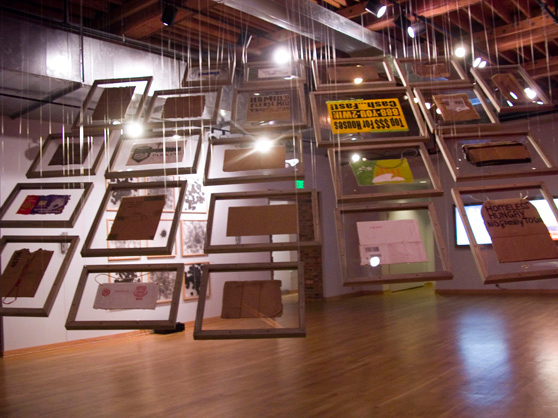 Which is exactly what Julia Kim Smith does in her photo project With Banksy. 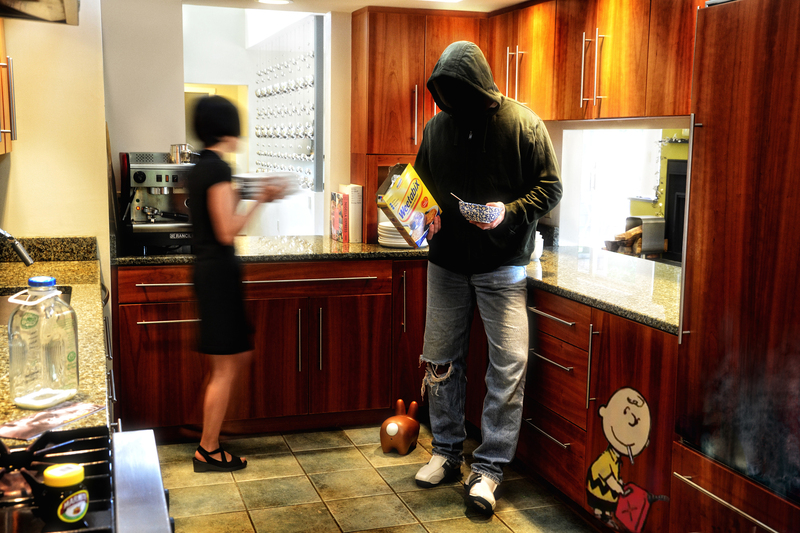 She heeds Banksy’s edict (and Picasso’s: “The Bad Artists Imitate, The Great Artists Steal”), appropriates his hooded identity, and places him and his work in her own scenarios. 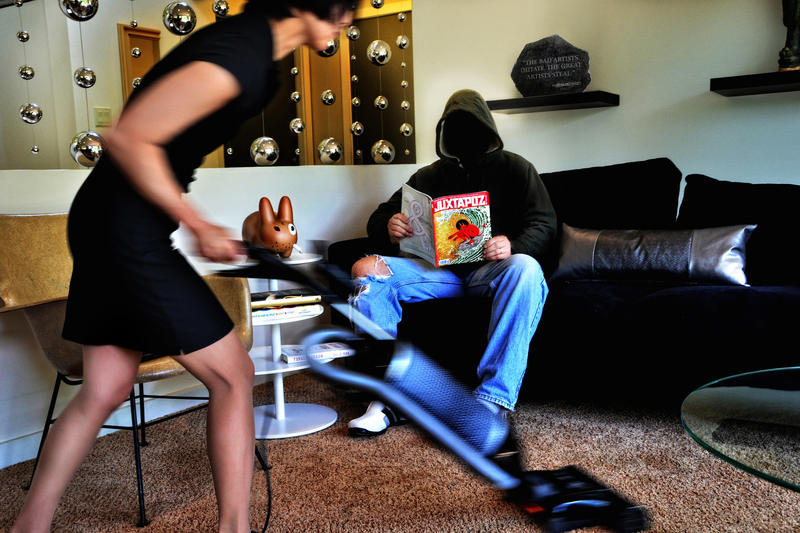 In a series of photographs that challenge gender and celebrity roles, “Banksy” lounges front and center while Smith performs daily chores. 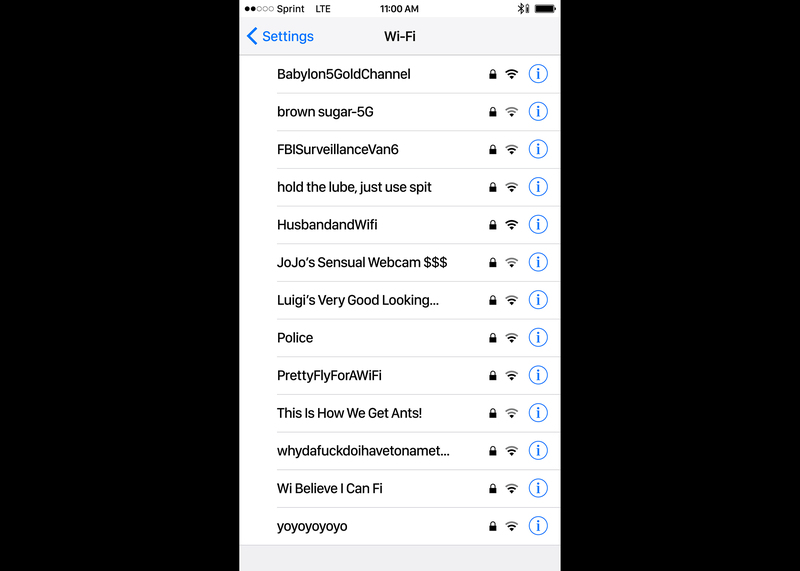 But Smith is more than just the accommodating hostess, with “Banksy” she creates new social memes and street art for the internet. 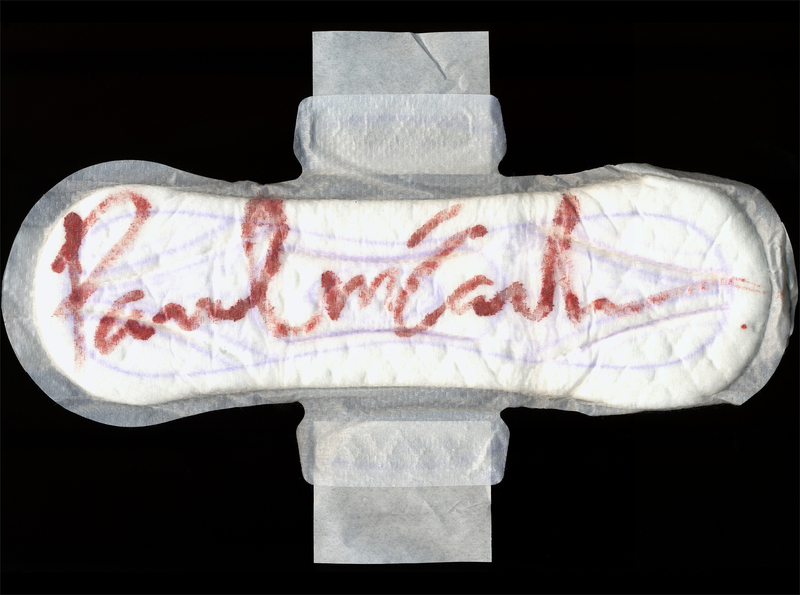 Web-based and archival pigment print, 12 x 18"
Julia Kim Smith utilizes Google’s search engine's autocomplete feature to find out what people are wondering about her, an Asian woman, and discovers unsettling abstractions, truths, fallacies, desires, and fears about all of us. Why is a compilation of 24 of the search engine results. 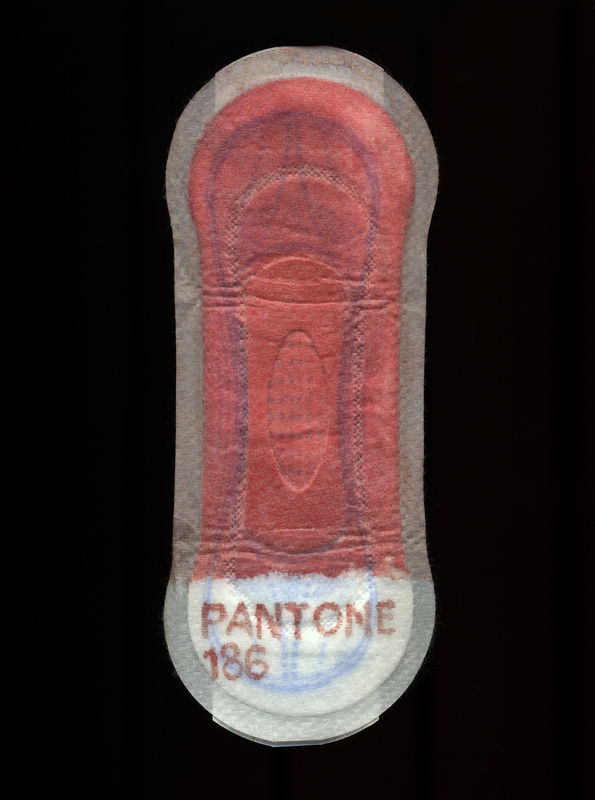 Inspired by Kellyanne Conway’s shopping tip “Go buy Ivanka’s stuff!”, the What To Wear To A Protest collection repurposes pieces from the Ivanka Trump line with hand-cut stencils, spray paint, and Sharpie. 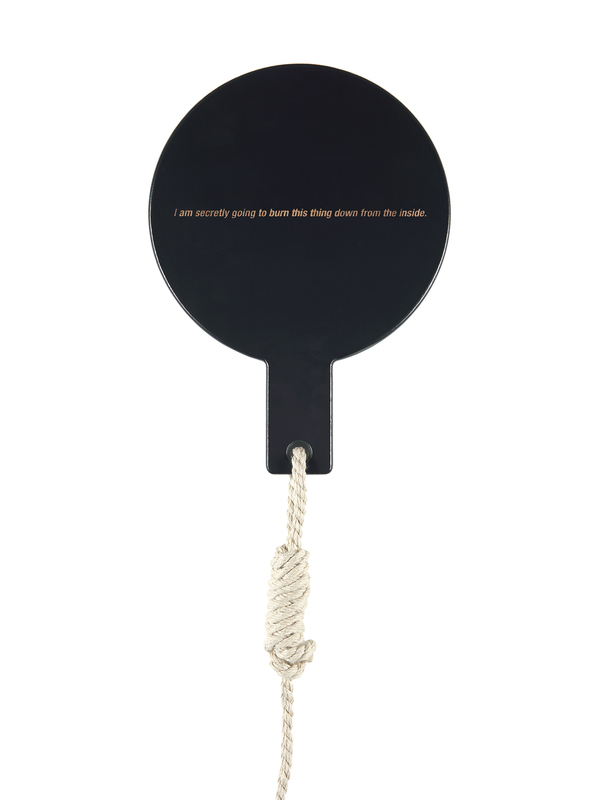 The What To Wear To A Protest collection is proudly spray painted in the USA. 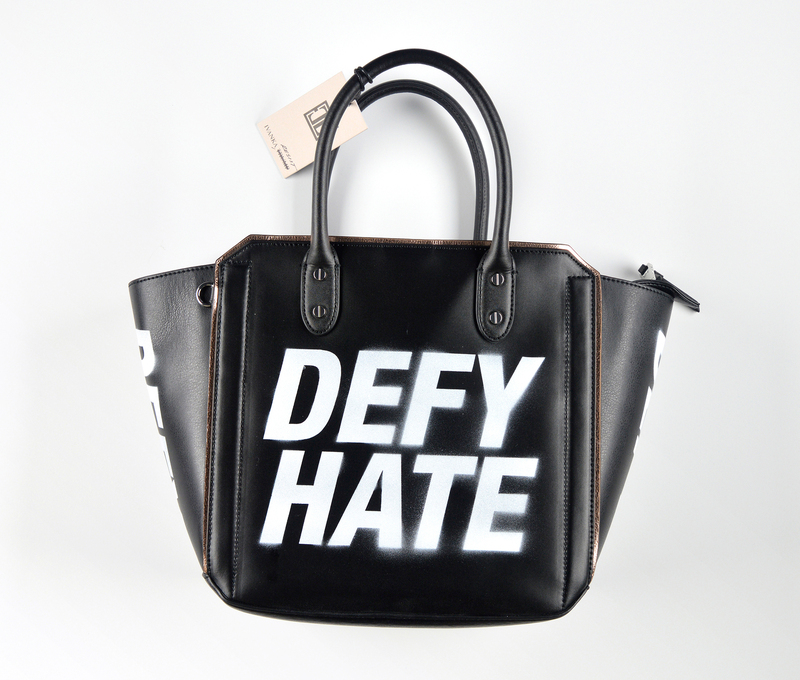 Satchel, spray paint, Sharpie, 11 x 17 x 5”, Description: The What To Wear To A Protest Satchel is the Ivanka Trump Tribeca Solutions Satchel with “DEFY HATE” spray painted in white on the outside, “RESIST” on the outside pocket, “DEFY” on both sides. Shoulder strap, removable zip pouch, and dust bag (not pictured) included. 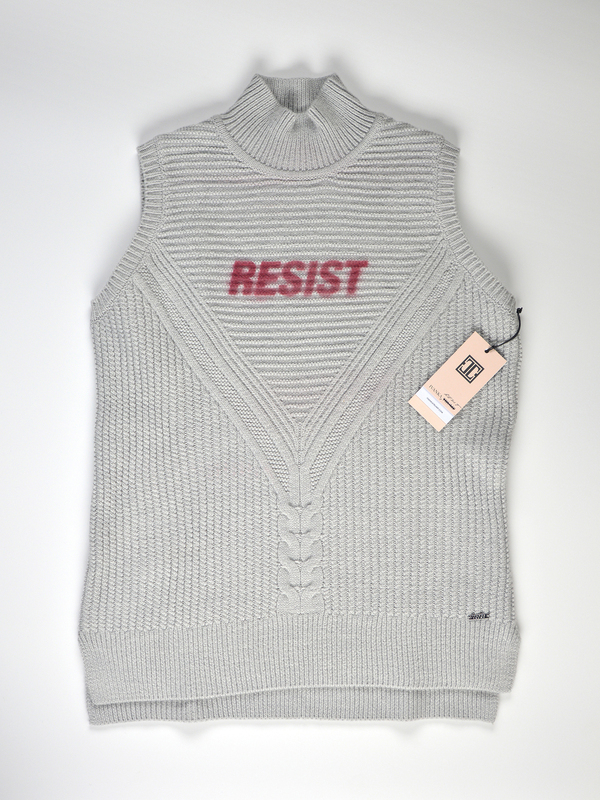 Sweater, spray paint, Sharpie, Size: XL, Description: The What To Wear To A Protest Sweater is the Ivanka Trump Sleeveless Sweater with “RESIST” spray painted in red on the front. 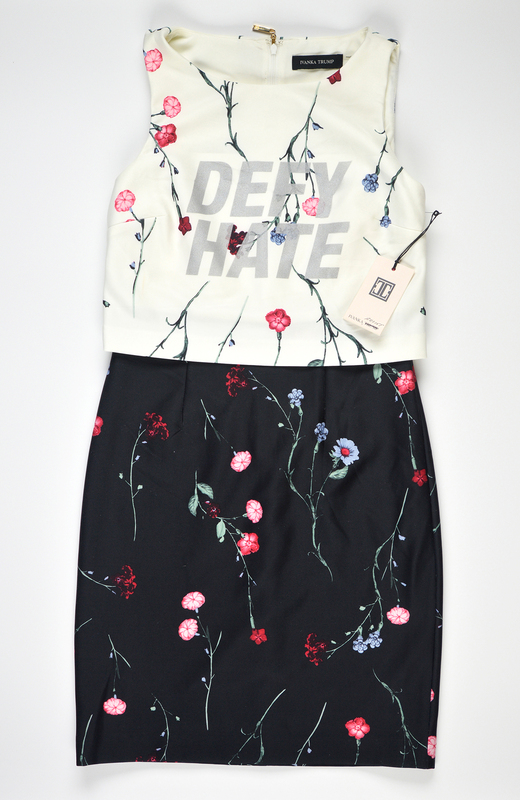 Dress, spray paint, Sharpie, Size: 2, Description: The What To Wear To A Protest Dress is the Ivanka Trump Scuba Pop-Over Dress with “DEFY HATE” spray painted in silver on the bodice. 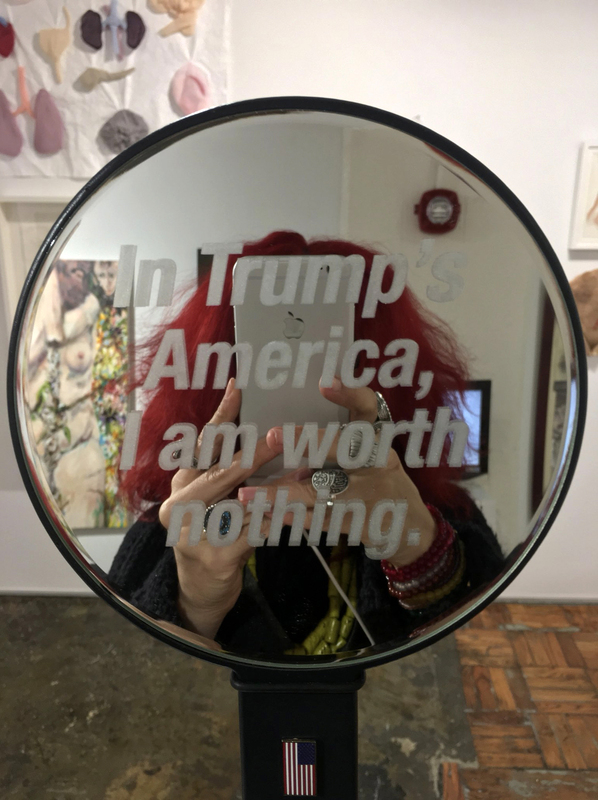 Selfie Mirror is a participatory installation piece: A hand mirror is mounted on a microphone stand with the words “In Trump’s America, I am worth nothing.” etched on the front of the mirror and “I am secretly going to burn this thing down from the inside.” etched on the back. 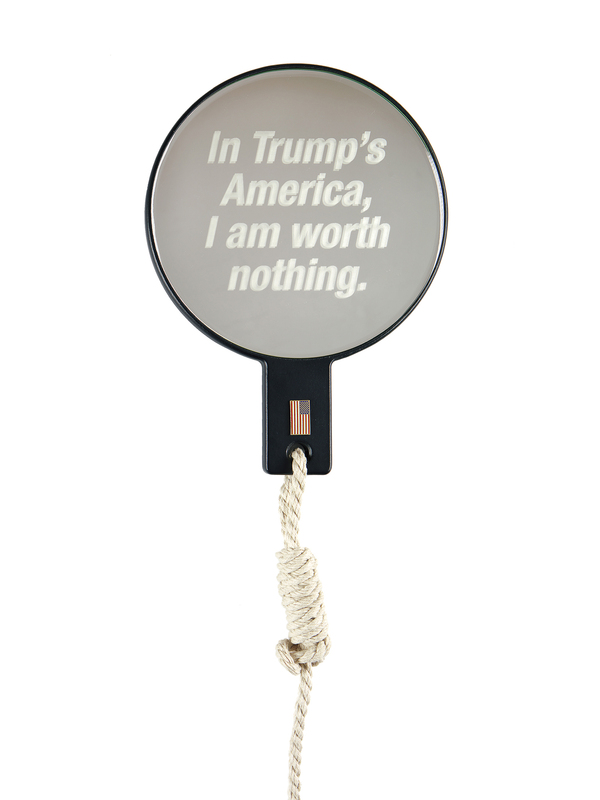 A piece of rope is tied to the mirror in a hangman’s noose and an enamel American flag pin is mounted to the mirror. 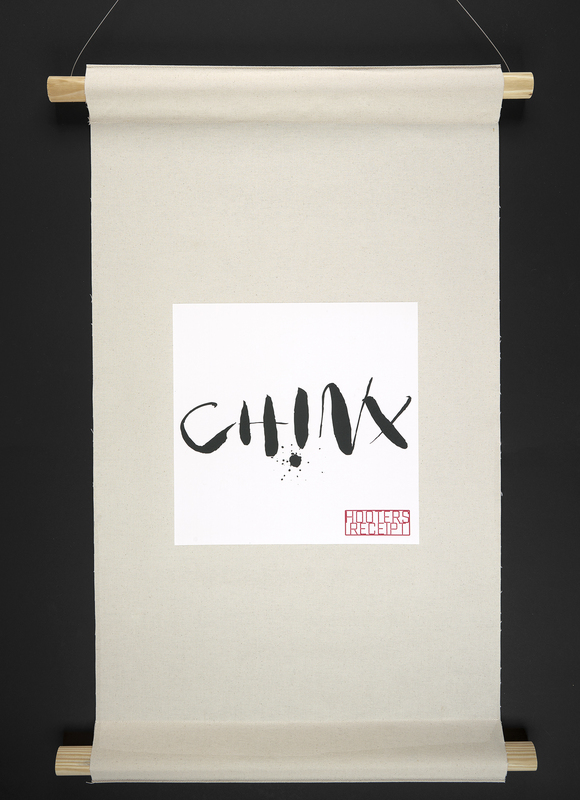 Receipts calls out and takes ownership of Asian and Asian-American slurs in a series of faux Asian-style scrolls featuring documented racist slurs received on sales receipts from Chick-fil-A, Hooters, and Papa John’s. 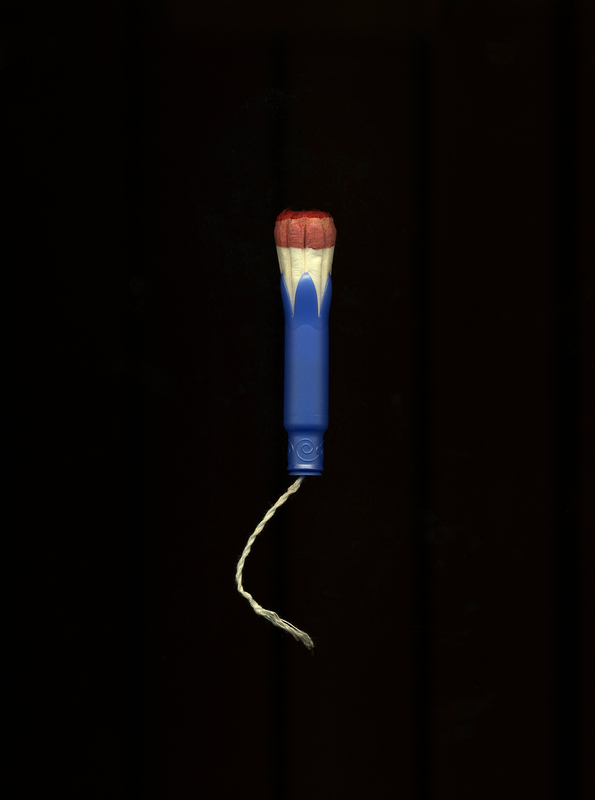 Archival pigment print on rice paper, linen, wood dowel rods, wire, 36 x 24"
In 2015-16, I participated in Exquisite Corpse, an exhibition at Fuse Art Space in Bradford, UK and Cologne, Germany, featuring the work of hot (professionally hot, that is) fourth-wave feminist artists Rupi Kaur, Kate Durbin, Faith Holland, Poppy Jackson, Sue Williams, among others. 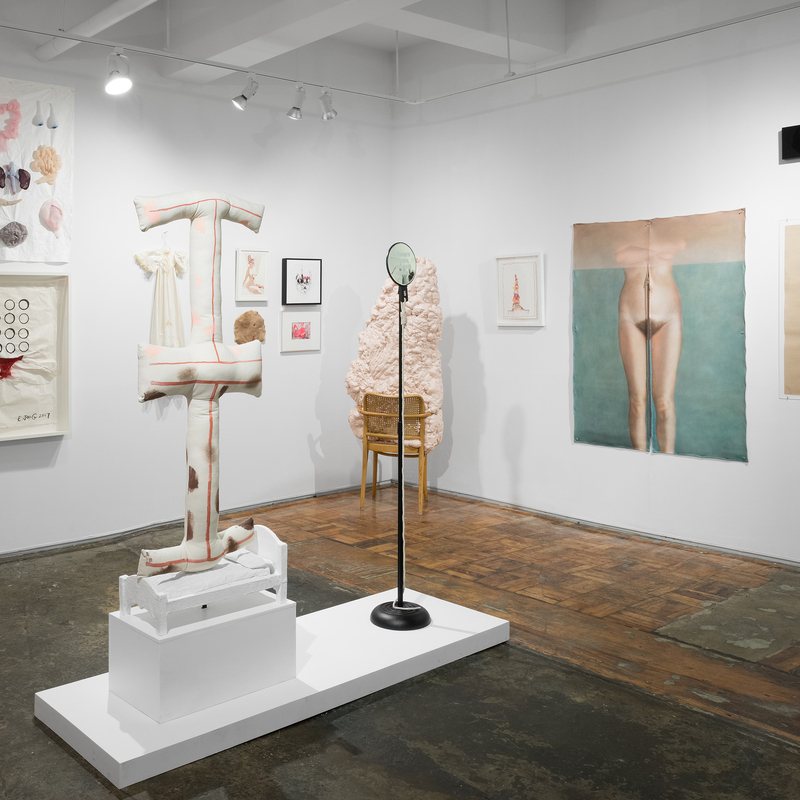 The exhibition challenged the misrepresentation of the female form and identity on the internet. 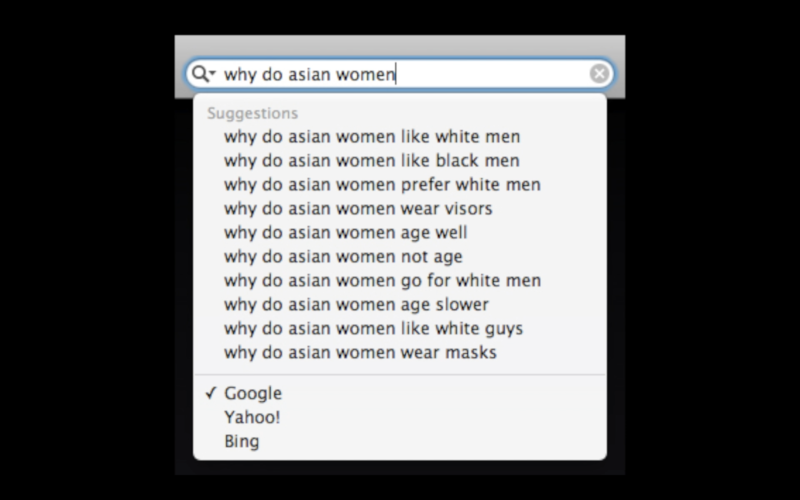 I screened Why, a film in which I utilized Google’s search engine’s autocomplete feature to find out what the masses wondered about me, an Asian woman, and discovered unsettling truths, fallacies, desires, and fears about many of us. 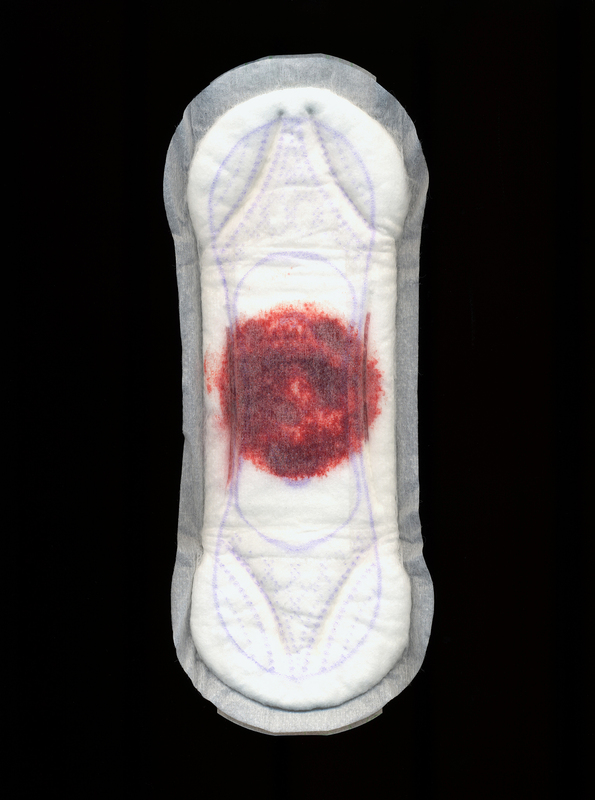 In conjunction with Exquisite Corpse, I took over Fuse Art Space’s Instagram account, posting from my series The Daily Pad–images created from Kotex products and blood–for six days, the duration of a period. 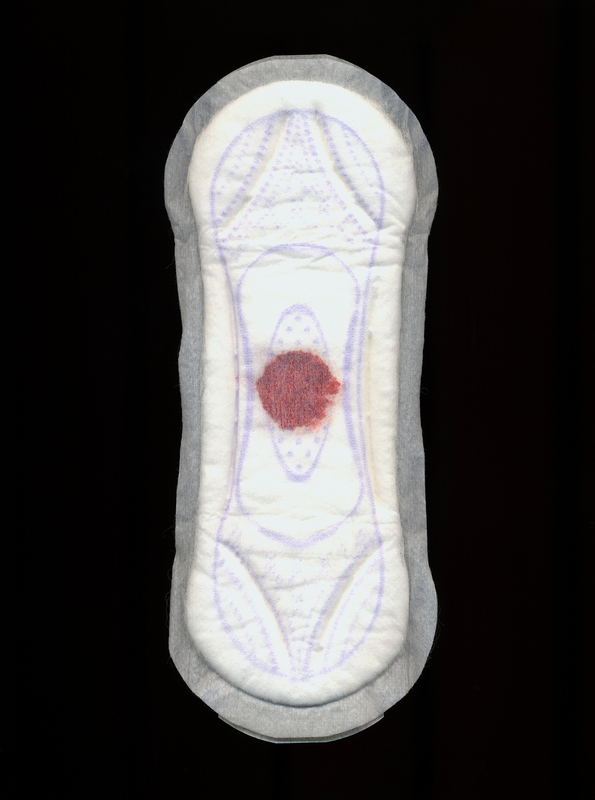 The Daily Pad is a humorous, Dadaist challenge to those who view female sexuality, including menstruation, as a taboo to shame, censor, and silence. 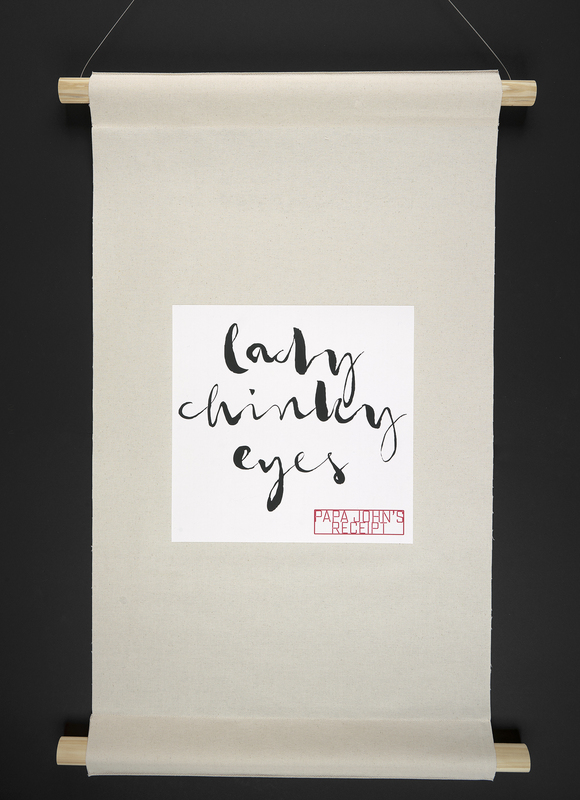 Sometimes the only rational response in the face of irrationality is to stop making sense. 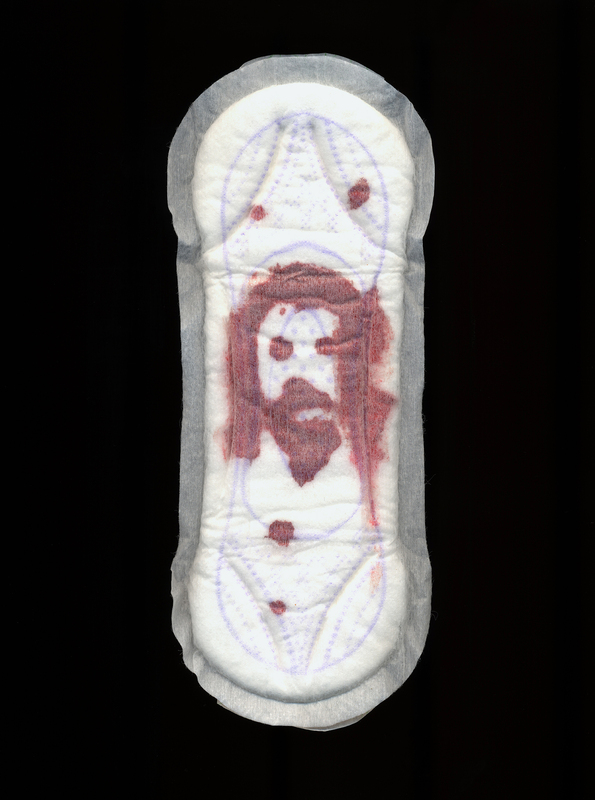 Kotex pad, blood, 9 x 3.5"
Baltimore, Actually, I like it. T-shirt and bumper sticker made in Baltimore: created and designed by Julia Kim Smith, printed by Stem Graphics Printshop, and available at Atomic Books. 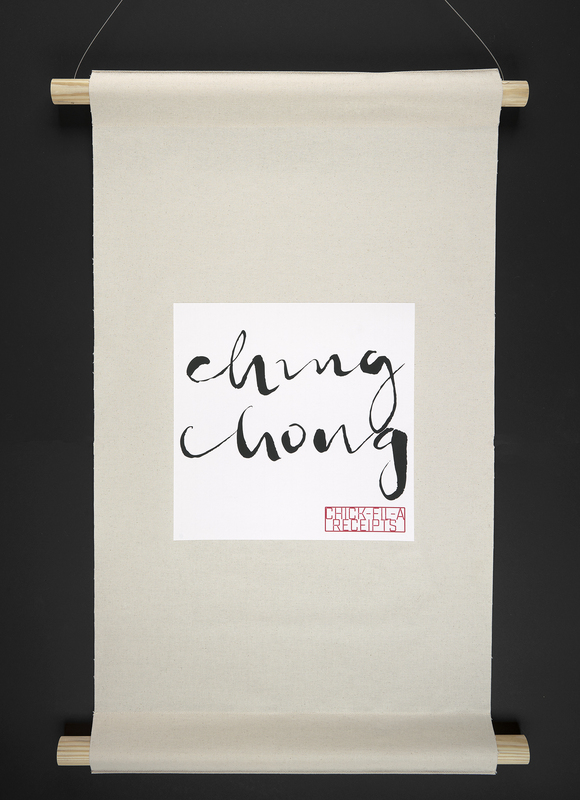 Every T-shirt and bumper sticker makes an impact: The artist donates 100% of profits to Creative Alliance. 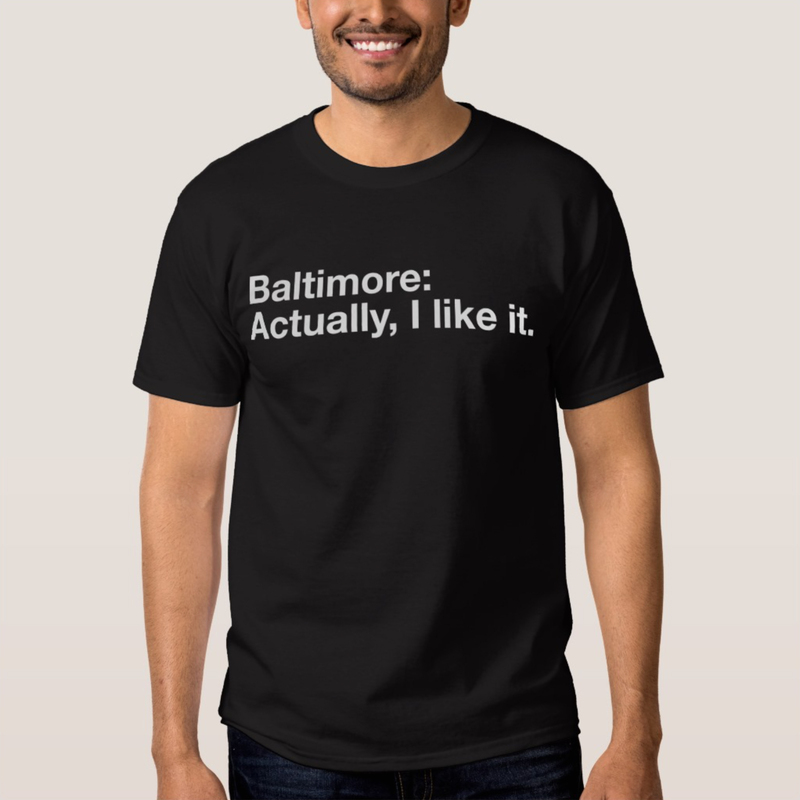 Baltimore: Actually, I like it. 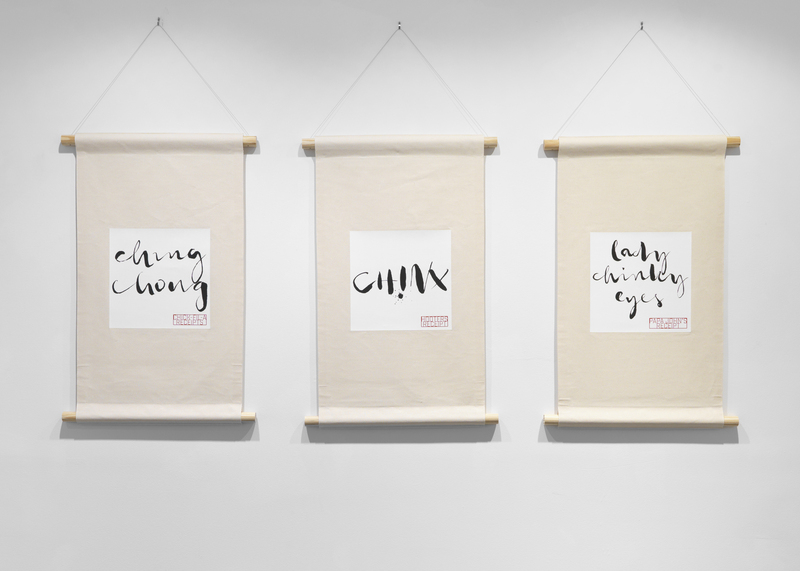 Bumper sticker, 3 x 9"
Alarmed by widening class divisions, Julia Kim Smith collected nearly 30 signs by the homeless and created a shelter-like installation as a statement of anonymous rage. Anonymous Rage may be viewed in different ways. The signs are real expressions of individual need and desperation. The signs are symbols of a society that cannot take care of its own. 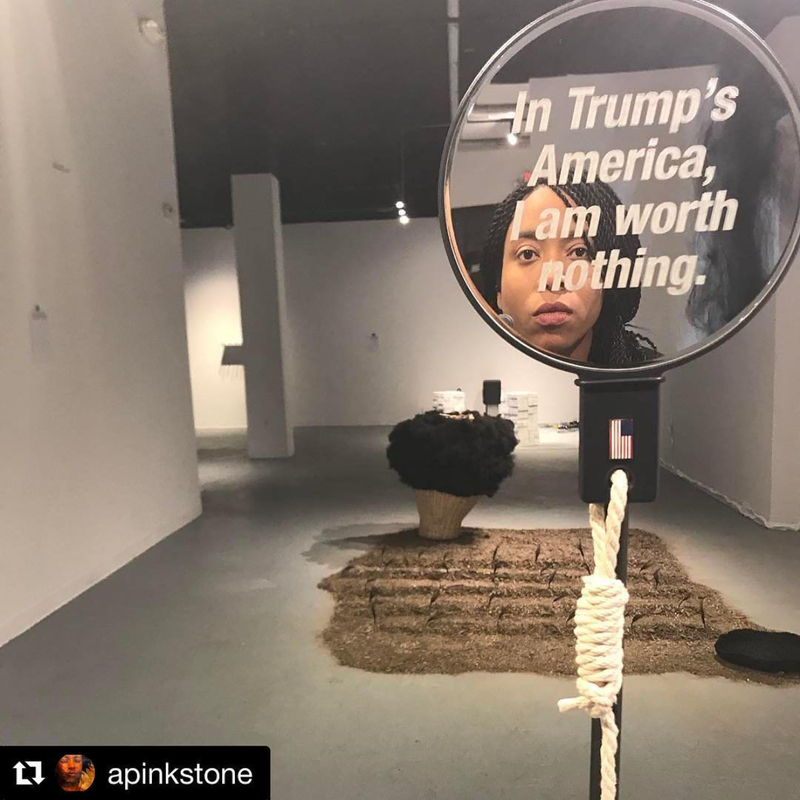 The signs are art, as valid as any other form, expressing an anonymous rage that cuts to the core and provokes raw emotions that range from compassion, fear, suspicion, and anger. 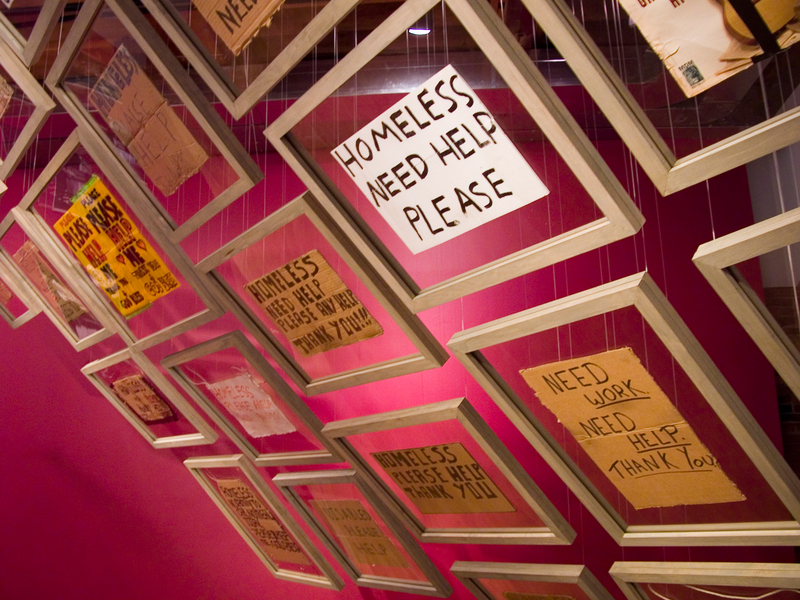 Through their signs, the homeless rebel against anonymity and invoke our vulnerability and mortality as individuals and as a society.